A recent Scientific American article discusses some areas in which people with dyslexia excel, compared to the general population. One finding: dyslexics can recognize impossible figures, like M.C. 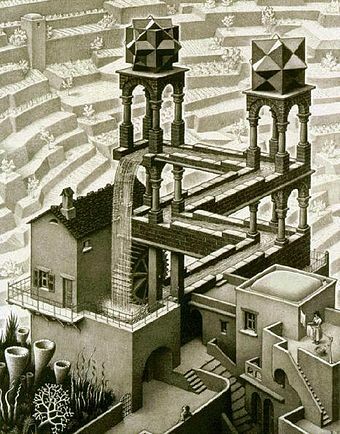 Escher’s “waterfall”, faster than people who learn to read “normally”. In addition, I was surprised to learn that when people learned to read, they lost some visual abilities. Some level of reading and writing skills are required to succeed in many regions and regimes in this world. Remediation enables dyslexics to function in the literary areas of modern society. That is important. And remediation should be accompanied with identifying and strengthening the skills and strengths of dyslexic students so they can take full advantage of them. I suspect that research into dysgraphia will yield some surprising results like these. Perhaps there already are some. If you know of any, please leave references in the comments.